It’s always bittersweet when the holidays wind down. The hustle and bustle is over, but so is the extended time to hang out with family and friends. This year was no exception. After our Christmas Eve and Christmas Day celebrations with some of our Colorado (and California!) 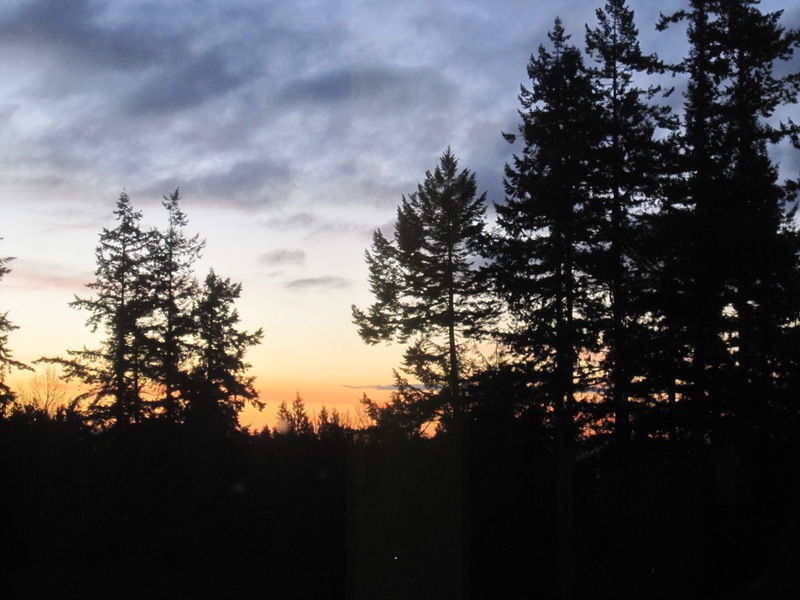 family, we traveled to Vancouver, British Columbia for the last week of 2015. 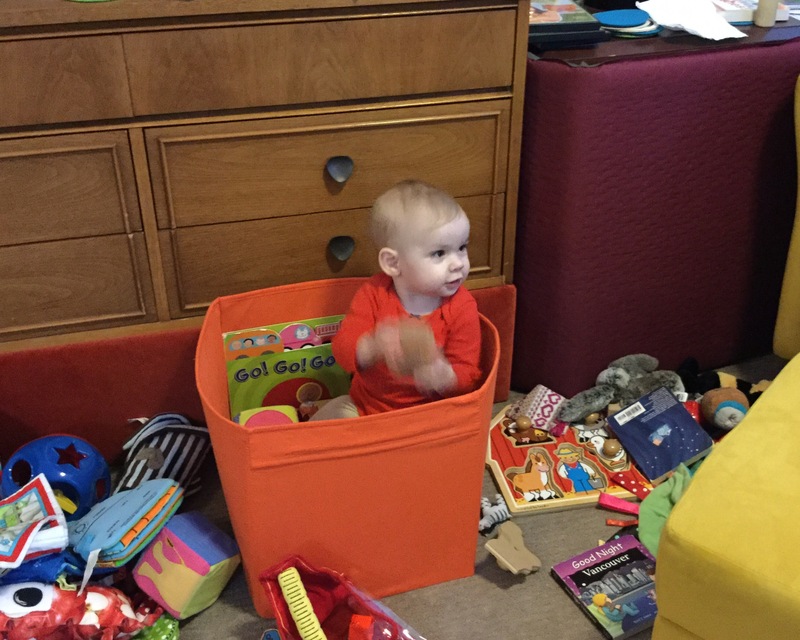 My folks had already made the trip to Canada in time to be there for my niece’s first Christmas. We chose to travel at a slightly less busy (and expensive) time. Fortunately, my brother and sister-in-law have some awesome friends who agreed to let the Powers clan invade their homes while they were away for the school break. We spent a lot of time hanging out, making and eating delicious food, and playing with Hazel. This is one of my favorite pics from that portion of the trip. We also played Carcassonne several times, which I really enjoyed. The game play, scoring, and rules are fairly straightforward, but the strategy is complex. Fun. Even though this was a new game for me, playing Eurogames (a word I just now learned) is not, so this does not get to count as a new experience. One of the benefits of travel, from my perspective, is that one usually does get to have many new experiences. Since we were focused on family time, and in a city I’d visited several times before, there were not quite as many opportunities, but there were some. 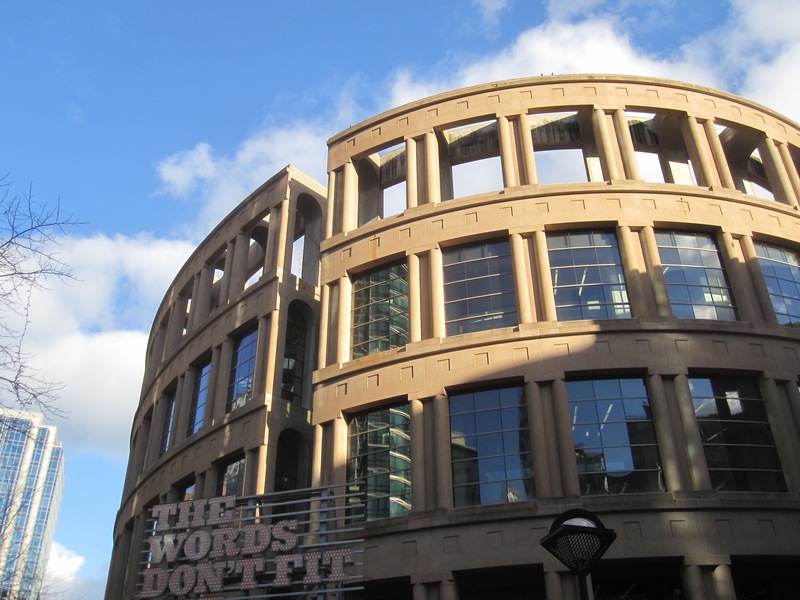 On Tuesday, all 8 of us (including the baby) ventured into Vancouver City Centre. Of the visitors, I was the only one who had even been in that part of the city, and there were several things to see within pretty easy walking distance of one another. It took two buses to get there from the University of British Columbia neighborhood where my brother and his family live. One was a standard diesel bus, while the other was an electric trolleybus. Vancouver is the only Canadian city to operate a trolleybus network, but since I grew up in the smallest of the U.S. cities that still operates trolleybuses, this was by no means a new experience. We enjoyed the views from the bus rides, even though it took some time to make the journey. Upon arrival, we spent some time considering lunch options, ate some waffles from Medina (yum! 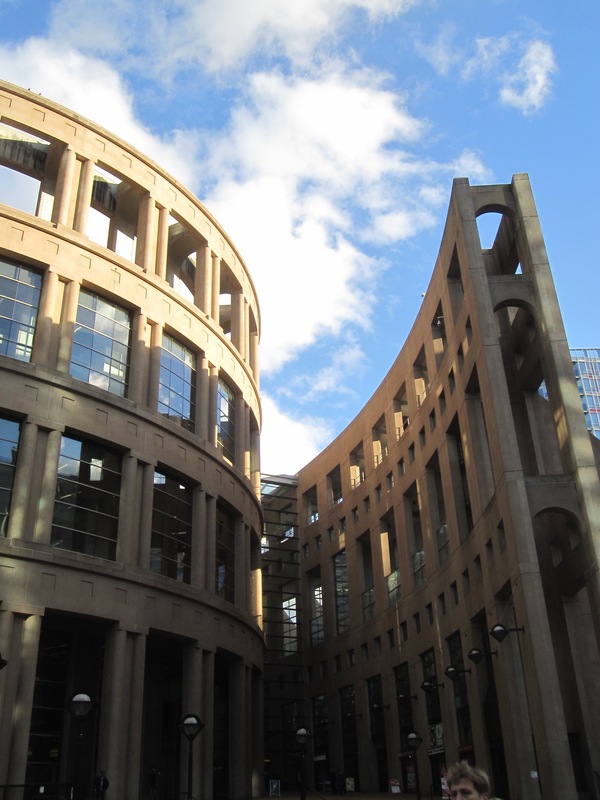 ), then checked out the Vancouver Central Library. 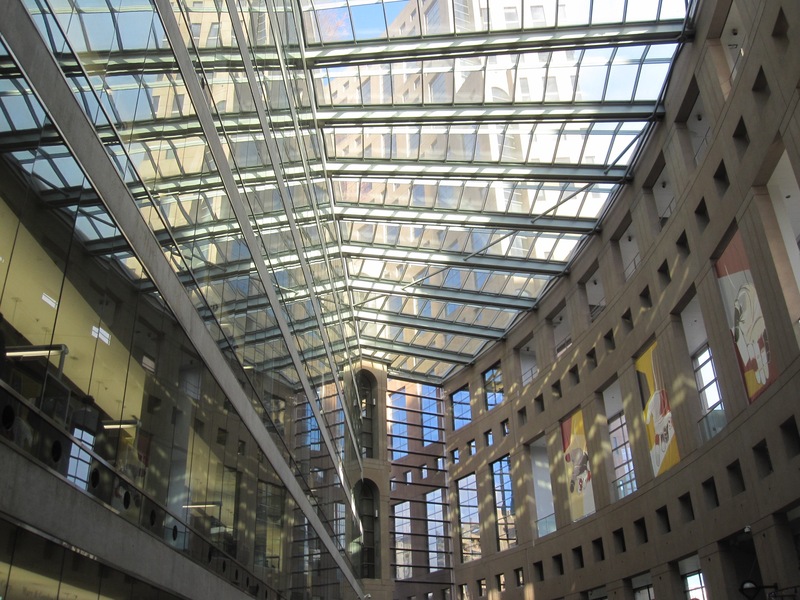 The outside is designed like the Colosseum in Rome and the building takes up an entire city block. 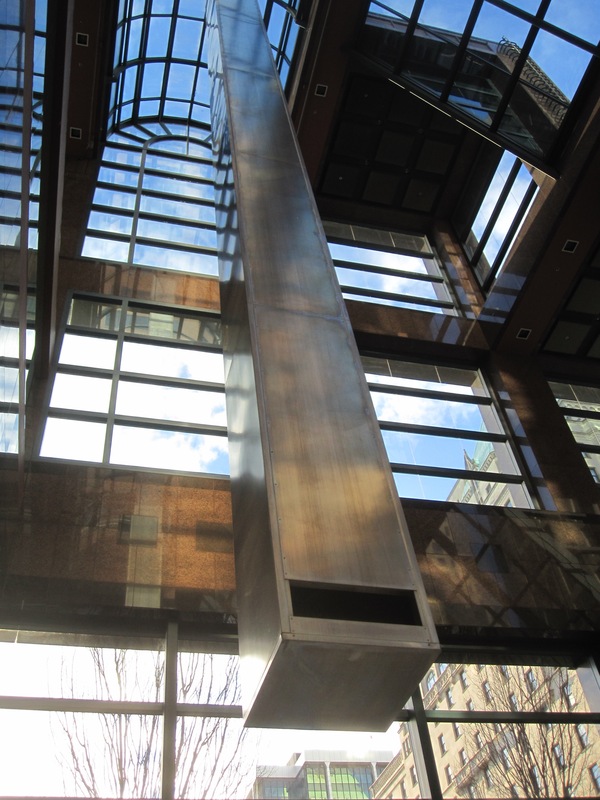 Next on our list was the huge pendulum in the HSBC building lobby. 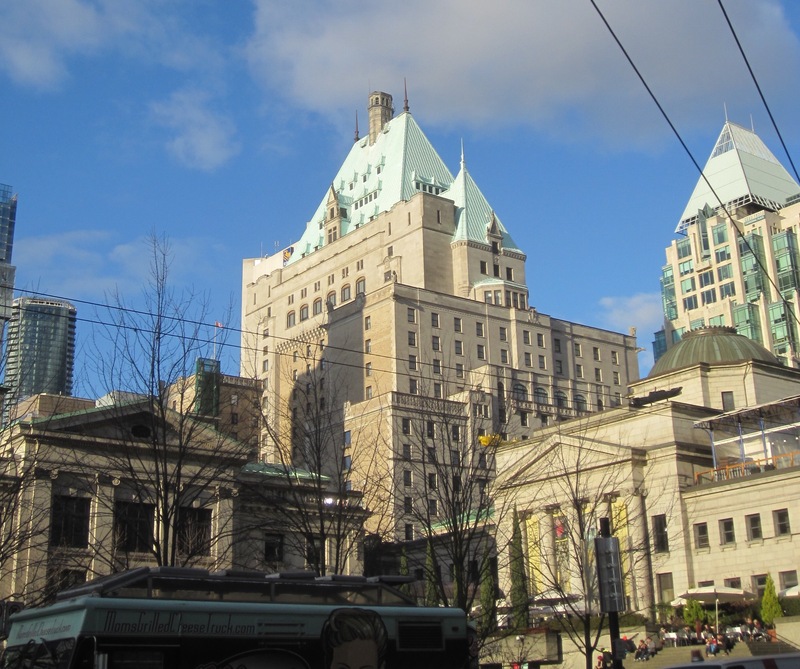 Along the way, we passed some art and other cool buildings, including the Fairmont Hotel Vancouver, where I hope to someday take afternoon tea. 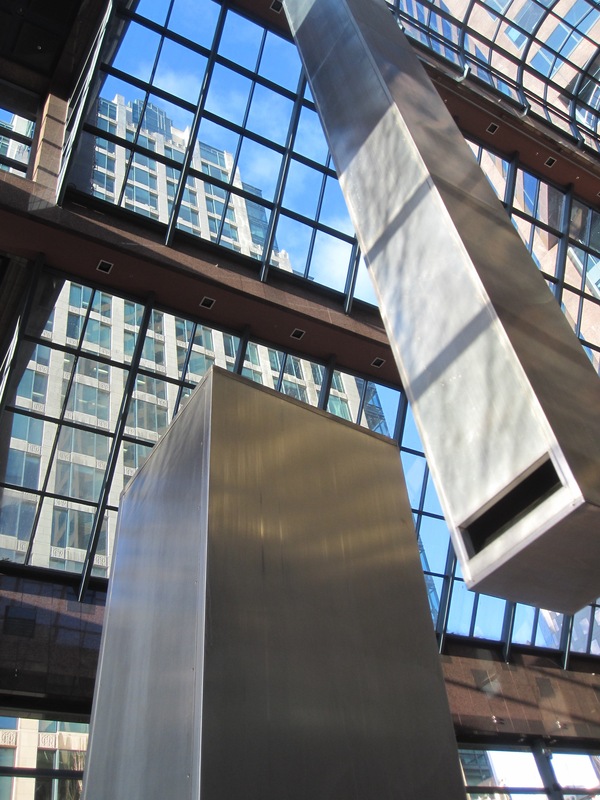 The pendulum is not an actual pendulum (it has power-assist), but rather a piece of art called Broken Column by Alan Storey. Twenty-seven meters is pretty big, so it is impressive. 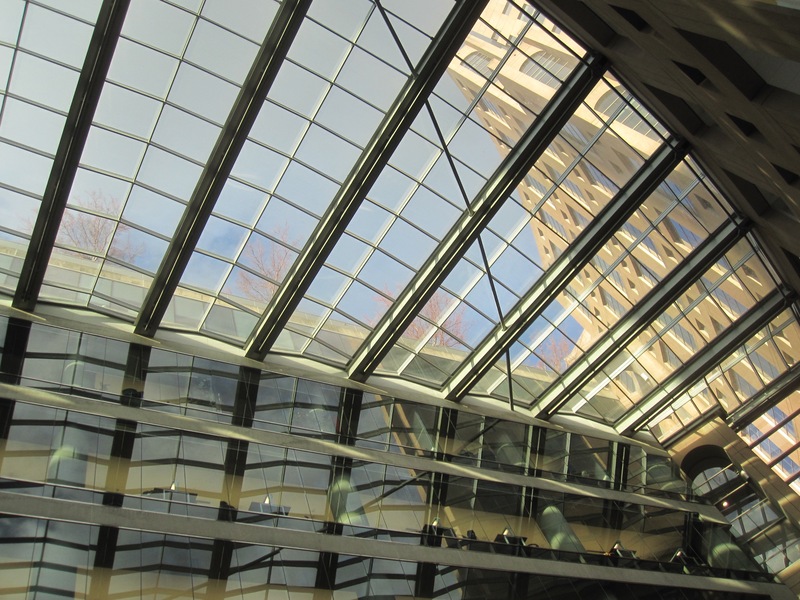 After the pendulum, we attempted to see the stained glass windows at Vancouver’s Christ Church Cathedral (yes, ABC), but it was closed for a major roof upgrade. 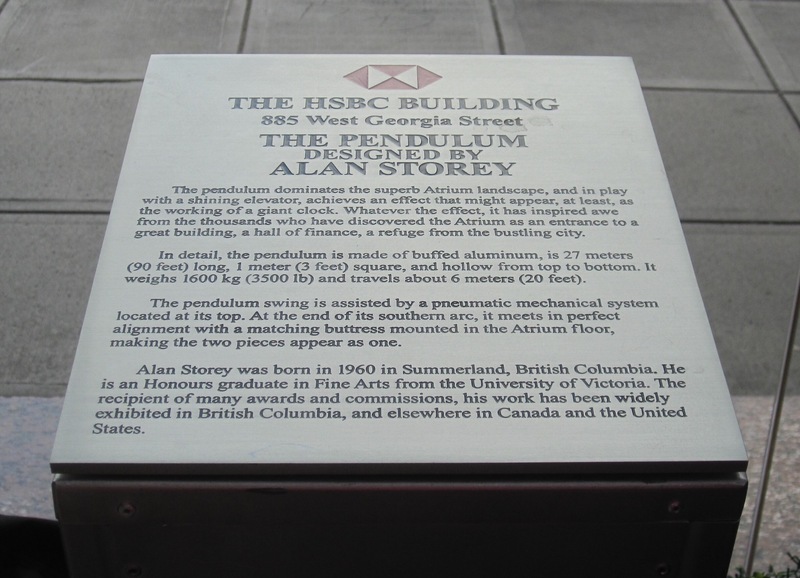 Our last stop on this adventure was the six-story Hudson’s Bay Company store adjacent to the rail station. There’s just something about a huge, downtown department store… We spent about 45 minutes going our separate ways for browsing, then regrouped for the trip “home.” We took the subway for the first leg of the journey, then transferred to a bus. 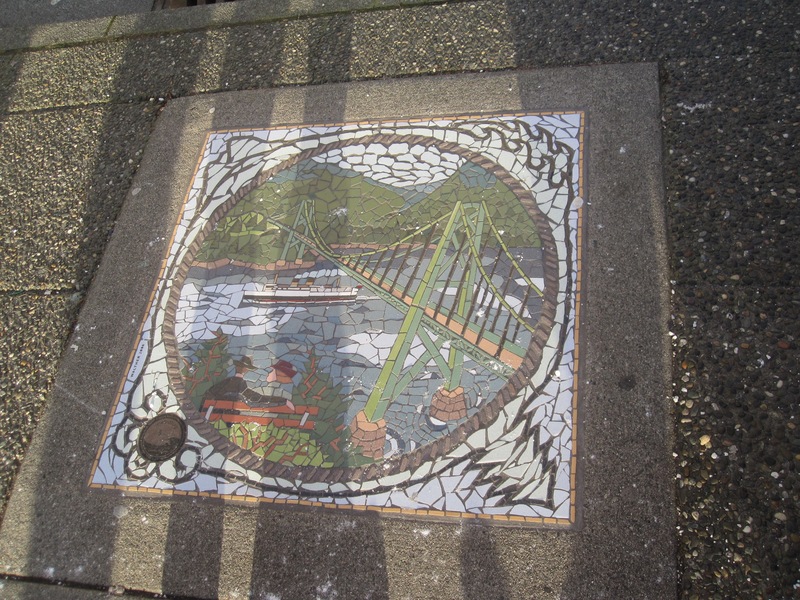 I’m counting this whole adventure as new experience #10–Exploring Vancouver’s City Centre. The next day was my parents’ last day in Vancouver, so we spent our time hanging out, playing games, taking pictures, and (of course) eating. 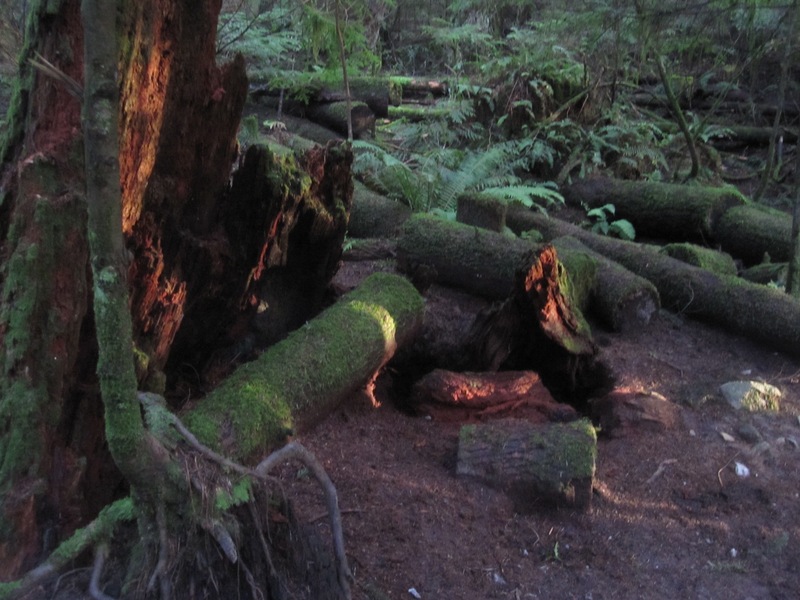 We did get in a nice, long walk in Pacific Spirit Regional Park, which is adjacent to the area where my brother lives. Maureen is reporting on this hike, so I’ll just say that I love this park and whet your appetite with one image. My new experience on this day (#11) was Canadian cider. Maureen and I like to try the local specialties in drinks as well as food. 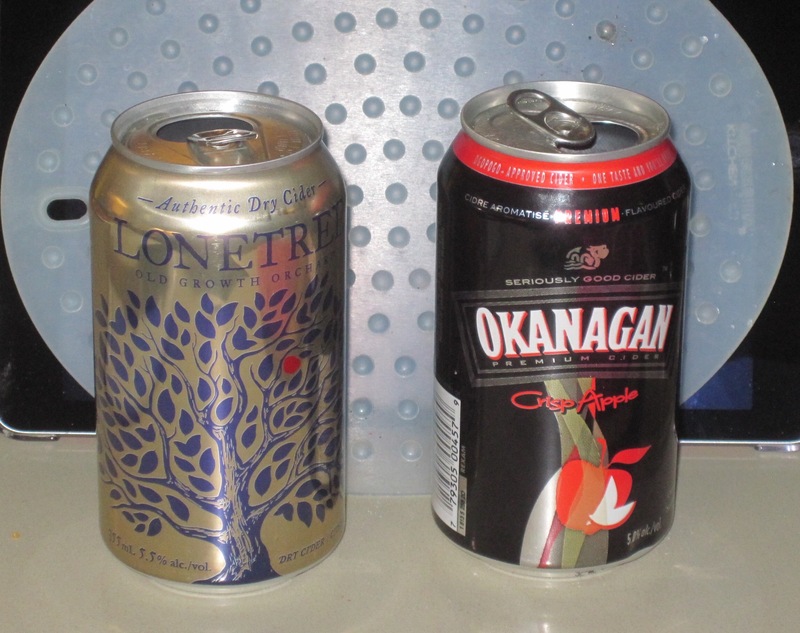 We decided on two ciders from the Okanagan (check the link for proper pronunciation) in British Columbia. During our final day in Canada, we ventured out again, this time for fabulous fish-n-chips and a little shopping. New experience #12 on this day was traveling in a car2go vehicle. I had never been in a smart car or (as best I can remember) a car-sharing vehicle, but I have been curious about these services. My conclusion about the smart car was that it is definitely small, but comfortable enough for two adults. It could certainly be useful for one-car households in cities where it is available (the reason my brother has a membership), but would not be practical for longer trips, larger groups, lots of “stuff,” or children too small to sit in the front seat (as it has no back seat). Apparently if you have a membership in one city you can use it elsewhere, so that would be useful for those who travel among the cities that have the service. All in all, it was a great visit with family, and we all got to have some fun new experiences as a bonus. As always, loved reading about your travels and the pictures are super, especially the tease. 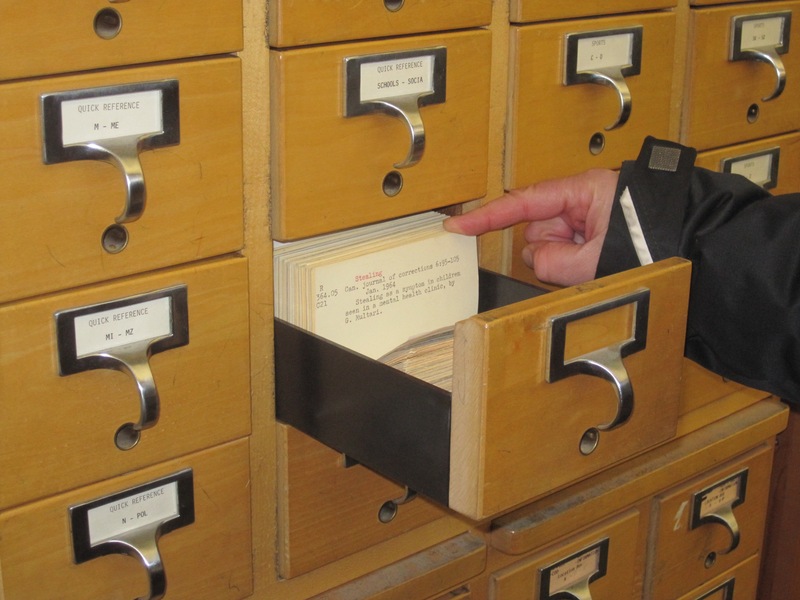 Until I saw your photos, I didn’t realize how much I missed card catalogs. Wow! Nice summary about your family’s vacation…so blessed to have each other. Happy New Year Angela…blessings to you and all your loved ones.